Hello, are there any plans to reinstate the species text for those species that have switched genera? For example Palliduphantes pallidus - the species account is now devoid of a useful textual summary, which can still be found if the old Leptyhphantes pallidus is googled directly. 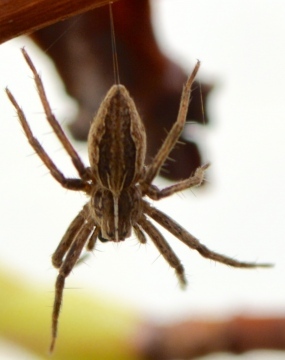 This is Pisaura mirabilis, the 'nursery web spider'. It will be juvenile this early in the season, and is a very variable spider in terms of pattern and colour. please could someone help id this spider found on a climbing plant in a sheltered back yard at grid reference SK 98963 71537, Lincoln UK. Body length- 10-12mm. I wondered if it was pardosa monticola Any help would be much appreciated, I have searched records but am not getting very far.